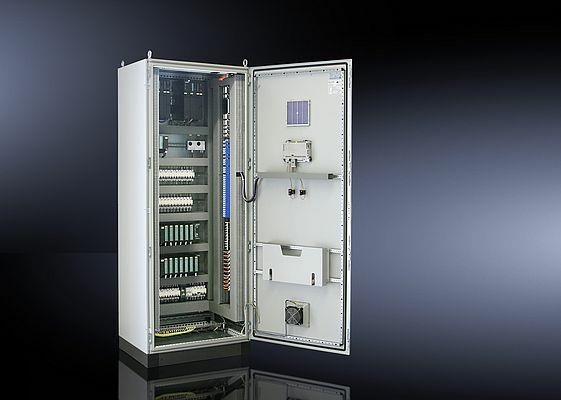 One important factor in the success of the Trips switchgear manufacturing company is its consistent use of the uniform modular system from Rittal. Here: Switchgear manufacture with bayed TS 8 enclosures. Rittal's TS 8 enclosure system can be configured everywhere, even on side panels and doors. With the AE, the rails can be installed quickly in the housing without any mechanical processing – on the side panels, roof or floor. Here: Floors. Assembling faster, better and cost-efficiently – this is exactly what the mid-sized German company Trips is doing, as it makes its switching and control systems and supplies them all over the world. One important factor in the company's success is its consistent use of the uniform modular system from Rittal. The intelligent mounting accessories of the TS 8 large enclosure series are a big plus. They guarantee a very large number of options for interior installation – and they can now also be used with compact enclosures. Trips GmbH, based in Grafenrheinfeld, Germany, has a lot be proud of. The successful family business is competing on an equal footing with some very big players indeed. Since 1999, Trips has been a "Siemens Solutions Partner", winner of the 2010 Siemens Supplier Award and has been an "ABB GoldPartner" since 2010. Every day, Trips supplies ready-made enclosures, CAD plans, controls and process control systems for customers all over the world. 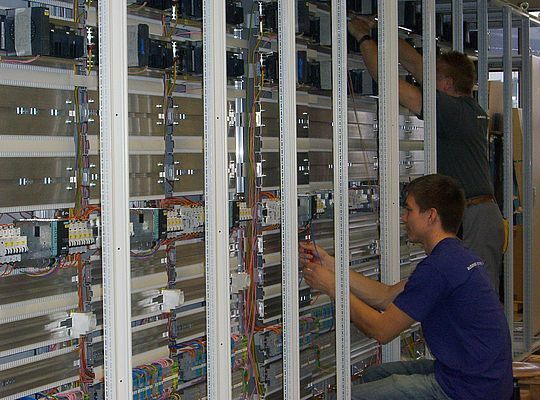 The switchgear manufacturer is highly professional when it comes to the construction of power distribution units, controls, as well as data and signal distribution systems. To this end, Trips has been using the Rittal complete system range for years: from the TS 8 large and bayed enclosure systems series to the CM and AE compact enclosures, which are frequently in use at the forefront in the industrial manufacturing. "The scalable system gives us the exact enclosure solution that we need for each application, when we need it," emphasizes Carolin Trips, member of the management board. "Size and configuration are always suited – no matter whether we are dealing with a massive bayable system or a medium sized compact control enclosure." Trips consistently makes use of the universal interior installation options that the TS 8 features. A modular range of accessories with a chassis and mounting rails that can be installed in next to no time in the frame section of the top enclosure system ensure that the TS 8 can be assembled everywhere, even on side panels and doors. Thus almost any necessary extension can be implemented. When it comes to smaller controllers, Trips relies on Rittal's CM and AE compact enclosure series – and in the case of interior installation also employs the TS 8 assembly system, which is also available for the purpose. 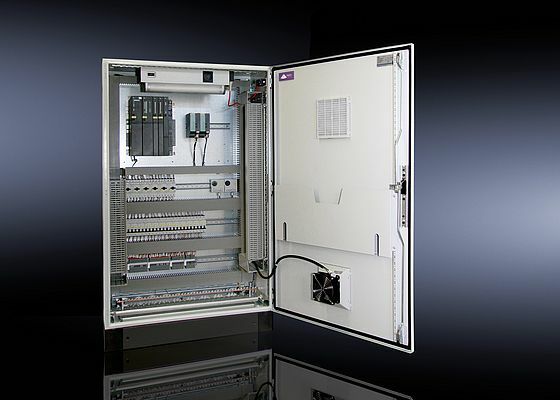 When it was launched in 2005, the CM was the first compact enclosure, for which Rittal could offer the top enclosure's (TS) universal expansion options. The side panels and panels and the floors of the CM have been factory equipped with a bolt system. In the blink of an eye, the rails for interior installation with TS 8 accessories are installed with threaded bolts – and the CM can be configured all round. Whereas conventional stand-alone or wall-mounted enclosures are focussed on conventional mounting plates, and the configuration of side panels calls for expensive re-work – such as the subsequent welding of bolts and retouching of damaged paint – the CM offers virtually unlimited expansion opportunities at all levels. Easily mountable base configuration rails provide even greater flexibility. The modular system is rounded off by the AE enclosure docking onto the TS 8 mounting system. The million-selling AE compact enclosure has long been one of the classics in the Rittal range. It closes the gap between the smaller CM and the large TS 8 enclosures. The AE enclosures are available in standard widths of 200 to 1000 mm, and up to 1400 mm in height. The enclosure depth ranges from 120 to 350 mm, so that space and protection can be offered for differently sized or small control systems. A large number of approvals – such as UL, DNV, TUV, VDE and CSA – ensure global success. Docking the AE enclosure to the TS 8 system was made feasible by the new AE interior installation rails. The rails can be installed quickly in the housing without any mechanical processing. Assembly is carried out simply by placing the rails against the rear panel and then screwing them to the front enclosure edge. The fastening technology (no drilling required) means that the AE enclosure's protection category (available at up to IP 69 K) remains unaffected. With the aid of the expansion rails, the classic AE has become a real system enclosure. Accessories and additions such as the TS 8 chassis, door-operated switch, lights, door supports, thermostats and hygrostats and components from a wide range of manufacturers can be easily installed. 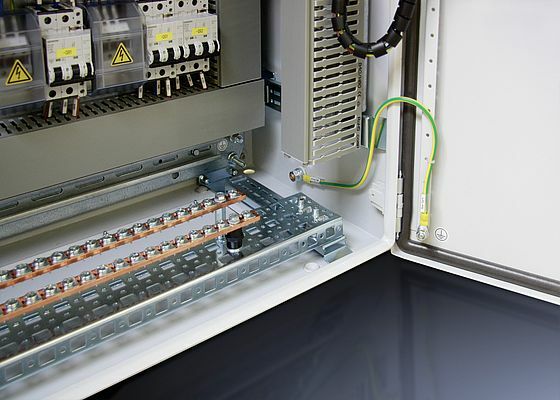 "While extensive do-it-yourself solutions had previously been required, thanks to the new rail systems, the interior installation of a typical AE enclosure nowadays takes just one-fifth of the time" adds Thomas Kleinhenz, team leader at Trips. While Trips used to have to drill, weld and pre-plan with compact enclosures, modifications can now be easily performed in the last minute thanks to the flexible mounting system. "In addition, we can also provide our customers with a solution for the compact, all-round assembly of the AE enclosure that is often less space-consuming, and which can lead to significant savings in space and costs," Mr. Kleinhenz added.